Specialized ('Universal Search' results, SERP Features): images, videos, news, local 3 packs, featured snippets and many more. With Rank Tracker you can track 15 types of so-called SERP features in addition to regular organic results. 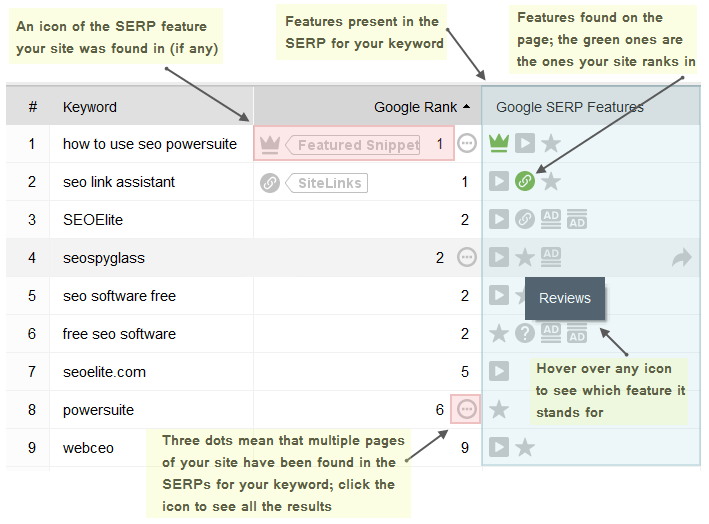 Below are the SERP features currently supported in the software. Tracking Google SERP features is enabled in Rank Tracker by default. 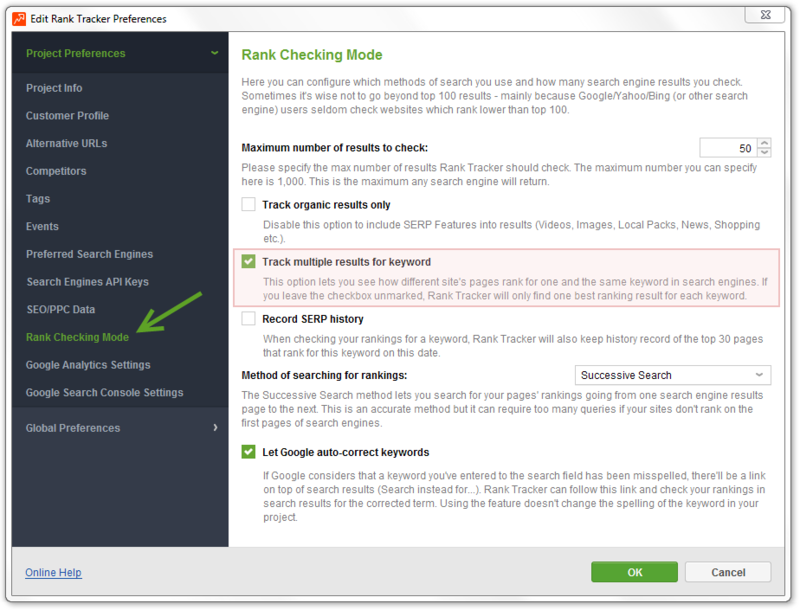 You can check if it's on for your Rank Tracker project by going to 'Preferences > Rank Checking Mode' and making sure that the 'Track Organic Results Only' box is unchecked, and the 'Track Multiple Results for Keyword' box is checked. Which SERP features your site ranks in. 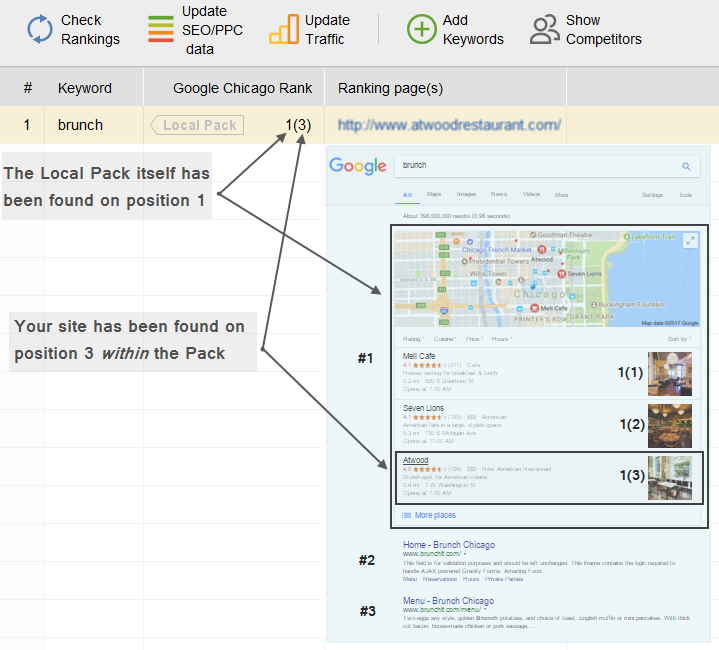 Which features show up for the keywords you're tracking. Which of the SERP features are occupied by your SEO competitors. To add the Google SERP Features (or Google Mobile SERP Features) column to your Rank Tracker workspace, right-click the header of any column and check the boxes next to the names of each column you'd like to add. Google (Mobile) SERP Features column will show all the features found on the results page for your keyword (the ones your site ranks in will be highlighted in green). In Google (Mobile) Rank column you'll see the icon of the feature your site was found in (if any), and the position. Hover over the feature icon to see a tooltip with its name. Hover over the Rank and click the arrow to see the cached results page. Click the three-dotted icon to see all the results, if multiple have been found for a keyword. In case your site ranks in a Local 3 Pack or Images/Videos section, you will see a rank with a sub-rank, like '1(3)'. This would mean that the pack or section is ranking #1 (first figure), and your site is ranking #3 within it (figure in brackets).